illustrated in Figure 1. 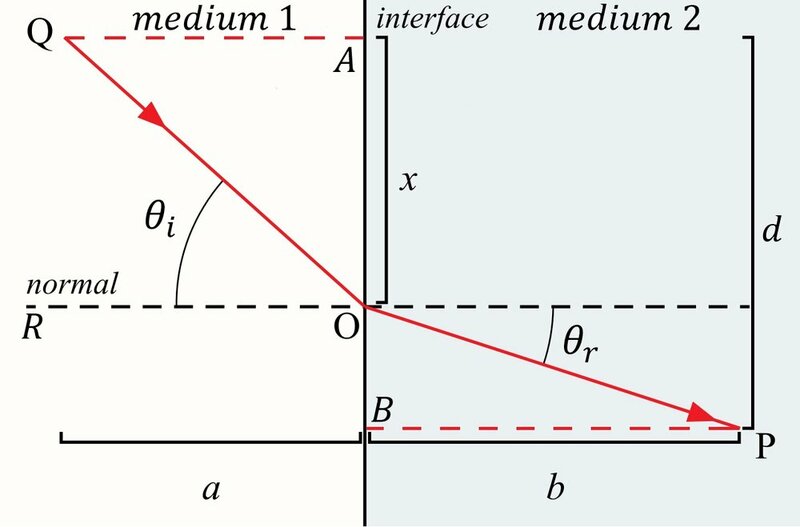 If the light ray strikes the surface at an angle \(θ_i\) relative to the line which is perpendicular to the surface, then that light ray might get reflected off of the surface depending on what kind of material the surface is made of. If the light ray does in fact get reflected—and by that, I mean "bounce" off the surface—then it'll be reflected at an angle \(θ_f\) (which is also measured relative to the perpendicular) and travel along some different path that we'll call \(OP\). It is an empirical fact that \(θ_i=θ_f\); this empirical fact is known as the law of reflection. This has been a well-known, observable fact for a very long time—since the first century in fact. Figure 1: A light ray traveling along the line \(QO\) comes into contact with a surface at an \(θ_i\) (where \(θ_i\) is measured relative to the line perpendicular to the surface). Once this light ray comes into contact with this surface, it is reflected at an angle \(θ_r\) (\(θ_r\) is also measured relative to the perpendicular). According to the law of reflection, \(θ_i=θ_r\). Image credit: Download for free at http://cnx.org/contents/60b4727b-829e-4ea7-9238-9140b6a1b20c@4. But, suppose that the path \(QO\) through which the light ray traversed is a different medium than that of the surface and below the surface. (I have labeled these different media medium 1 and medium 2 in Figure 2.) For example, suppose that medium 1 in Figure 2 is air and medium 2 is water. Then, because the two media are different, instead of the light ray reflecting off of the surface it might instead get refracted through the surface. Refraction is just a technical term that phycisists use to describe a light ray passing through one medium and then passing through another medium. If \(θ_i\) is the angle that the light ray makes with the line \(RO\) when it reaches the surface (this angle is known as the angle of incidence), and if \(θ_r\) is the angle between the light rays new path \(OP\) (the path it takes as it travels through medium 2) and the line \(RO\) (a line which is perpendicular to the surface), then \(θ_i≠θ_r\). The reason why \(θ_i≠θ_r\) is because when the light ray enters into a different medium, its path—although still a straight line—gets "bent." The mathematical relationship between \(θ_i\) and \(θ_f\), and how the angle \(θ_f\) could be determined given that the angle \(θ_i\) is known, remained a mystery for over a millennium. But during the seventeenth century, a mathematician named Pierre de Fermat cracked this mystery. It was known then that, provided the medium doesn't change, then light will travel at a constant velocity (meaning that both the speed of alight ray and the direction of a light ray is traveling in will not change) through that medium. It was also known that the speed of light can be different\(^1\) in different media. When the astronomer Christian Hyugans discovered that light can act like a wave, he used this fact (the fact that the speed of light is different in different media) to explain what physically causes the path of a light ray to get "bent" as it travels from one medium into another. But we'll explain that in more detail in a separate lesson.) With this fact in mind, we'll let \(v_1\) denote the speed of the light ray in medium 1 and we'll also let \(v_2\) denote the speed of the light ray in medium 2. Fermat also had to make a postulation (an "educated guess"): namely, if \(P\) and \(Q\) denote the initial and final locationas of a light ray, respectively, then the light ray will take the path which will allow it to get form \(P\) to \(Q\) in the least amount of time possible. This axiom is known as the principle of least time. This principle explains why light travels in a straight line if the medium that it goes through doesn't change: because that's the path which allows the light ray to travel form one place to another place in a period of time that is shorter than if it took any other path. This principle also explains the law of reflection. The reason why after the light ray gets reflected off of the surface (see Figure 1) it takes a path \(OP\) such that \(θ_f=θ_i\) is because that is the path which allows the light ray to get ot its final location in the least time. Equation (5) is known as Snell's law (or the law of refraction) and it gives us the relationship between \(θ_i\) and \(θ_r\) for various different kinds of materials. 1. Kline, Morris. Calculus: an Intuitive and Physical Approach. Dover, 1998. 3. Smedlib. “Snells law Diagram B vector.” Wikipedia, Smedlib, Wikipedia, Jul 3, 2017, https://commons.wikimedia.org/wiki/User:Smedlib. 1. Refraction and light bending. 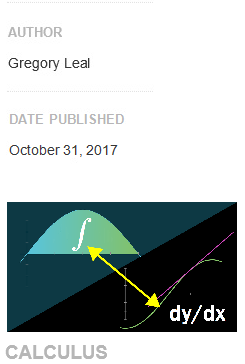 Retrieved from https://www.khanacademy.org/science/in-in-class-12th-physics-india/in-in-ray-optics-and-optical-instruments/in-in-reflection-and-refraction/a/refraction-and-light-bending. 1. Actually, the speed of a light is a universal constant. Technically speaking, it is the average speed of light which can change from one medium to another.